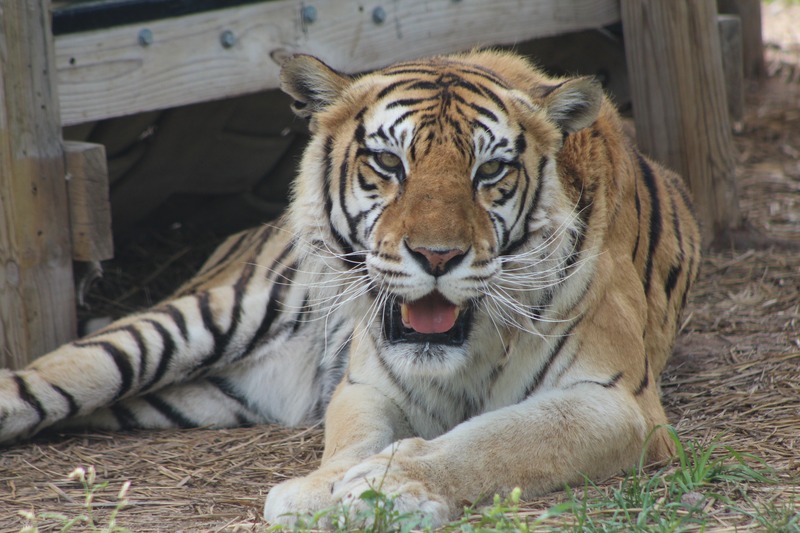 Layla came to us through the largest big cat rescue in history. Almost 60 big cats needed placement in 2010, after a facility in Texas closed down. I was placement coordinator for all the big cats and it took countless hours and a little over a year before all the big cats had been relocated to their new homes. The first day I walked through the facility, there were tigers as far as the eye could see. How was I going to choose who we could take, and who would be placed first? It was a heart wrenching decision. Many of the tigers were chuffing and rubbing, playing with plastic kegs or living with companion tigers. Then there was Layla. She was a geriatric tiger. Her enclosure was on the edge of the property, she had little in her enclosure because she was a known climber and they were worried about safety in her open top enclosure. She was laying on a concrete den, just staring through me, not even acknowledging my presence. I knew we only had so much space back at The Wildcat Sanctuary, but after the first trip, her face continued to haunt me. She looked void in spirit, but physically in good shape for an older cat. She was beautiful and had an elegance about her. I just had to find a w ay to bring her to TWS, even if she only had a short time left. Happily, she lived five blissful more years here at the Sanctuary. It took her a little while to warm up, but the glaze in her eyes faded and her heart softened. She quickly became a favorite of everyone. At 25, she enjoyed life. She would trot after cubs Jeremy and Simon along the shared fence and even roar at Tonka intimidating the biggest boy at the Sanctuary. She had stunning beauty, but would also show her playful side – a refined spunkiness of sort. We could see her health declining in waves this summer. She had small masses developing on her face and a few nose bleeds. There were days she was more tired than usual. But after treatment, she rebounded and would be back to stalking and being spunky. We’d also find her lounging in her new pool or napping between her hammock and the trees. She had a good life. Recently, she slowed down again, but it was different this time. It was the first time the glazed look in her eyes returned. The look that had haunted me the day I met her. Saying good-bye was very difficult for each of us, but it was time for her to reign over a new world. We let her enjoy her last days in the beautiful summer sun, lying in the tall grass before it was time to let her go. Layla, your beauty inside and out will never be forgotten. You truly were a queen to us and the Sanctuary. 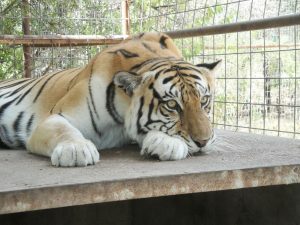 In 2010, The Wildcat Sanctuary accepted nine cats from the Wild Animal Orphanage in Texas as part of a big cat rescue after they closed down due to funding issues. 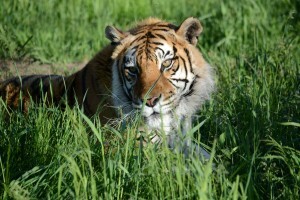 Layla was born in 1991 and originated in Mississippi as a privately owned exotic pet. Layla has a very calm demeanor but occasionally gets the sudden urge to run around her habitat usually with a piece of food hanging from her mouth. Given her age and her shy temperment, this usually makes for a good laugh for anyone watching. She is also very curious but slow to accept anything new. She really enjoys lounging in her pool on hot summer days and soaking up some rays on her perch. Layla is a favorite among staff. She has a funny way of talking, its sort of like she is trying to whisper a moan, very adorable.